Use of this Site. Amateur Equestrian provides you with access to and use of the Site subject to your compliance with the Terms. This Site may only be used for lawful purposes. You are responsible for the consequences of your communications, uploads, transmissions and posting of information on or through the Site and for any use of the Site by anyone accessing it using your login information. By submitting information through this Site you represent that you are 18 years old or older. Licenses. The Site, including all of its contents, such as text, images, and the HTML used to generate the pages, are our property or that of our suppliers or licensors and are protected by patent, trademark and/or copyright under United States and/or foreign laws. Except as otherwise provided herein, you may not use, download, upload, copy, print, display, perform, reproduce, publish, modify, delete, add to, license, post, transmit, or distribute any such materials from this Site in whole or in part, for any public or commercial purpose without our specific written permission. We grant you a personal, non-exclusive, non-transferable license to access the Site and to use the information and services contained on the Site subject to your compliance with these Terms. In turn, you grant us a non-exclusive, royalty-free license to use any content you post on the Site for any purpose, subject to the express provisions of these Terms. Changes to these Terms. We reserve the right to revise any of these Terms in our sole discretion at any time by updating this posting, such changes to be effective prospectively. We include the effective date of our Terms at the top of the statement. We encourage you to check our Site frequently to see the current Terms in effect and any changes that may have been made to them. If we make material changes to the Terms we will post the revised Terms and the revised effective date on this Site. Your continued use of the Site after a change has been posted constitutes your acceptance of the change. If you disagree with any changes to these Terms, your sole remedy is to discontinue your use of this Site. Informational Purposes Only. All content available on this Site is provided for informational purposes only. Your use of any information or materials on this Site is entirely at your own risk, for which we will not be liable. It shall be your own responsibility to ensure that any products, services or information available through this Site meet your specific requirements. Modifications to the Site. We reserve the right, for any reason, in our sole discretion and without notice to you, to terminate, change, suspend or discontinue any aspect of the Site, including, but not limited to, information, data, text, sound, photographs, graphics, video, messages or other materials (“Content”), as well as features and/or hours of availability, and we will not be liable to you or to any third party for doing so. We may also impose rules for and limits on use of the Site or restrict your access to part, or all, of the Site without notice or penalty. We have the right to change these rules and/or limitations at any time, in our sole discretion. Copyright. This Site, and all content available on this Site, is protected by copyright. Unless specified otherwise on the Site, no portion of this Site may be copied, republished, transmitted, or distributed in any way without Amateur Equestrian’s prior written consent. Any such use of the Site’s content for any purpose not authorized under these Terms is a violation of the copyrights of Amateur Equestrian (or other entities where so indicated). Permission for all uses of the Site other than as expressly authorized under these Terms, including linking to any page at this Site other than the home page, must be obtained from Amateur Equestrian in advance. Any such request should be submitted via an email to info@theamateurequestrian.com. The use of this Site, or any content available hereon, on any other website or networked computer environment is prohibited. All design rights, compilation rights, and other intellectual property rights in and to this Site, in each case whether registered or unregistered, and related goodwill are proprietary toAmateur Equestrian or its licensors. Trademarks. 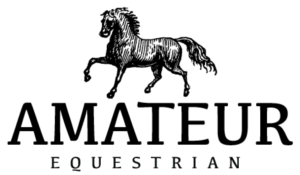 All trademarks, service marks, logos and trade names on this Site, whether registered or unregistered, are proprietary to Amateur Equestrian or to other companies where so indicated. You may not reproduce, download or otherwise use any such trademarks, service marks, logos or trade names without the prior written consent ofAmateur Equestrian or the appropriate owner thereof. Site Security. You are prohibited from violating, or attempting to violate, the security of this Site. Any such violation may result in criminal and/or civil penalties against you. Amateur Equestrian will investigate any alleged or suspected violations and if a criminal violation is suspected, we will cooperate with law enforcement agencies in their investigations. User-Submitted Information. You should exercise good sense and sound judgment when using this Site. You are responsible for any information that you transmit to the Site. You represent and warrant that any information you transmit to the Site is truthful, accurate, not misleading and offered in good faith, and that you have the right to transmit such information. International Use. We control and operate the Site from our offices in the United States of America, and all information is processed within the United States. We do not represent that materials on the Site are appropriate or available for use in other locations. Those who choose to access the Site from outside the United States do so voluntarily and are responsible for compliance with their local laws. Links to Other Websites. For your convenience, this Site may contain links to other websites. If you follow these links, you will leave this Site. Certain of these third-party websites may make use of Amateur Equestrian’s trademarks, service marks, or logos under license from Amateur Equestrian. We are not responsible for the availability or content of these other websites or for any experience you may have with such third-party websites, whether or not Amateur Equestrian is affiliated with the owners of such websites. In addition, providing links to these websites should not be interpreted as endorsement or approval by Amateur Equestrian of the organizations sponsoring such third-party websites or their products or services. Copyright Claims. The U.S. Digital Millennium Copyright Act (“DMCA”) provides recourse to copyright owners who believe that their rights under the United States Copyright Act have been infringed by acts of third parties over the Internet. If you believe that any content on this Site infringes upon any copyright which you own or control, you may notify us in accordance with our DMCA process accessible here. Jurisdictional Issues. This Site is controlled and operated byAmateur Equestrian from its offices within the State of New Jersey, U.S.A. Those who choose to access this Site from outside the U.S.A. do so on their own initiative and are responsible for compliance with local laws, if and to the extent such laws are applicable. Access to this Site from jurisdictions where the contents of this Site are illegal or penalized is prohibited. No information from this Site may be downloaded or otherwise re-exported (i) into or to a national or resident of any country to which the United States embargoes or sanctions goods, services or technology; or (ii) to anyone on the U.S. Treasury Department’s list of Specially Designated Nationals or the U.S. Commerce Department’s Table of Denial Orders. By using information from this Site, you represent and warrant that you are not located in, under the control of, or a national or resident of any such country or on any such list. Termination. Amateur Equestrian may terminate your use of this Site at any time in our sole discretion. Upon any such termination, you must destroy any content obtained from this Site and all copies thereof. The provisions of these Terms which contemplate surviving, including the provisions concerning Site security, prohibited activities, copyrights, trademarks, user submissions, disclaimer, limitation of liability, indemnity, and jurisdictional issues, shall survive any such termination. No Guarantee. You acknowledge that Amateur Equestrian does not represent or guarantee the accuracy, reliability, availability, timeliness, performance, completeness or suitability of any of the materials or any other content available on this Site. You acknowledge that such content may contain inaccuracies or errors and we expressly exclude liability for any such inaccuracies or errors to the fullest extent permitted by law. Pet Pharmacy/Health Content. All content available in any pet pharmacy portion of this Site, or in any other health portion of this Site, is provided for informational purposes only. Such information is not intended to be, and is not, professional veterinarian advice or a substitute for such advice, or for diagnosis, treatment, cure, or prevention of any health conditions for your pet or any other animal, and you should not rely on them as such. You should always seek the advice of a veterinarian if you have any questions about any of the information you receive from this Site. Amateur Equestrian does not represent or guarantee that such information is accurate, complete, or timely. Disclaimers. ALL OF THE CONTENT AVAILABLE ON THIS SITE IS PROVIDED “AS IS” AND WITHOUT WARRANTIES OF ANY KIND. TO THE FULLEST EXTENT PERMISSIBLE PURSUANT TO APPLICABLE LAW, AMATEUR EQUESTRIAN DISCLAIMS ALL WARRANTIES, EXPRESS OR IMPLIED, INCLUDING, BUT NOT LIMITED TO, IMPLIED WARRANTIES OF MERCHANTABILITY, FITNESS FOR A PARTICULAR PURPOSE AND NON-INFRINGEMENT. AMATEUR EQUESTRIAN DOES NOT WARRANT THAT THIS SITE WILL BE UNINTERRUPTED OR ERROR-FREE, THAT DEFECTS WILL BE CORRECTED, OR THAT THIS SITE WILL BE FREE OF VIRUSES OR OTHER HARMFUL COMPONENTS. AMATEUR EQUESTRIAN DOES NOT MAKE ANY REPRESENTATIONS OR WARRANTIES REGARDING THE USE OR THE RESULTS OF THE USE OF THE CONTENT ON THIS SITE IN TERMS OF THEIR CORRECTNESS, ACCURACY, RELIABILITY, OR OTHERWISE. Applicable law may not allow the exclusion of implied warranties, so some or all of these disclaimers may not apply to you. Limitation of Liability. TO THE EXTENT PERMITTED UNDER APPLICABLE LAW, UNDER NO CIRCUMSTANCES SHALL PETCO BE LIABLE FOR ANY CONSEQUENTIAL, INCIDENTAL, SPECIAL, OR INDIRECT DAMAGES RESULTING FROM THE USE OF, OR THE INABILITY TO USE, THIS SITE, EVEN IF AMATEUR EQUESTRIAN OR AN AMATEUR EQUESTRIAN AUTHORIZED REPRESENTATIVE HAS BEEN ADVISED OF THE POSSIBILITY OF SUCH DAMAGES. Applicable law may not allow some or all of this limitation of liability, so it may not apply to you. Indemnity. You hereby indemnify, defend, and hold Amateur Equestrian and our affiliates, and our respective officers, directors, owners, agents, information providers, licensors and licensees, harmless from and against any and all liabilities and costs incurred in connection with any claim arising from your use of Site or your breach of these Terms. You shall cooperate with us in the defense of any such claim. We reserve the right, at our own expense, to assume the exclusive defense and control of any matter otherwise subject to indemnification by you hereunder. Governing Law; Jurisdiction. These Terms shall be interpreted in accordance with the laws of the state of New Jersey without reference to its conflict of law provisions. For all purposes of these Terms, Amateur Equestrian and you consent to exclusive jurisdiction and venue in the United States Federal Courts or state courts located in Monmouth County, New Jersey. Jury Trial and Class Action Waiver. To the fullest extent permitted by law, you waive the right to a trial by jury with respect to any dispute arising out of or relating to these Terms or your use of the Site. You further agree that any and all disputes or controversies between you and Amateur Equestrian shall be resolved on an individual basis without resort to any form of class action and shall not be consolidated with the claims of any other parties. Your waiver of the right to bring any dispute as a class action shall not be deemed unenforceable even if the governing state law would otherwise permit the action to be filed and prosecuted as a class action. Other. If any provision of these Terms is unlawful, void, or for any reason unenforceable, then that provision shall be deemed severable from these Terms and shall not affect the validity and enforceability of any remaining provisions. This is the entire agreement between the parties relating to the subject matter herein. Any failure or delay on our part in enforcing our rights under these Terms shall not be deemed a waiver of our rights. These Terms inure to the benefit of our successors and/or assigns.